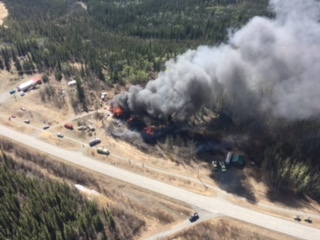 A home on the Old Richardson Highway near Copper Center was destroyed Tuesday afternoon as the result of a grass fire that originated from an unattended burn barrel on the property. Wildland firefighters from the Alaska Division of Forestry and several local fire departments responded to the Old Richardson Fire, which was reported at 1:43 p.m. Forestry firefighters were the first to arrive on scene about 25 minutes after the fire was reported. By that time the grass fire was infringing on the structure and propane and fuel tanks around the home were exploding. Forestry firefighters made sure the occupants were safely outside the home and focused on preventing the structure fire from spreading into the wildlands until local VFDs arrived on scene. The home was fully engulfed by the time structure firefighters arrived a few minutes later. Another structure on the property was destroyed in the fire but it was unclear whether it was a residence or outbuilding. Division of Forestry personnel prevented the fire from spreading into the wildlands, containing it to approximately 2 acres. The cause of the fire was an unattended fire that escaped from a burn barrel near the home. Conditions in the Copper River Basin are extremely dry and neither the grass nor the trees have greened up yet, acting Fire Management Officer Mike Trimmer with the Valdez/Copper River Area office in Tazlina said. A burn suspension was enacted Tuesday afternoon in the Valdez/Copper River Area following the fire. The burn suspension prohibits debris burning and the use of burn barrels until conditions moderate. Small campfires are still allowed but fire managers advise against any burning given the dry conditions. 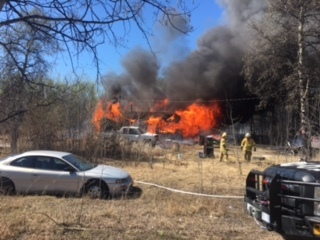 Three forestry engines and 10 DOF personnel responded to Tuesday’s fire, as well as firefighters from GlennRich Fire Rescue, the Kenny Lake Volunteer Fire Department and Gakona Volunteer Fire Department.